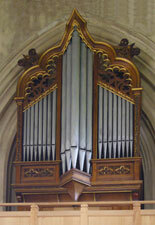 Listed organs with Historic Organ certificates (HOCS) are noted, with grades. The NPOR was begun in its present computer-based form in 1991 by Peter le Huray and Mike Sayers.at Emmanuel College, University of Cambridge. 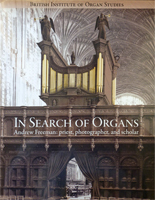 The service is now hosted by the Royal College of Organists. The structure and history of the NPOR to 2012 is described in an article by Mike Sayers that can be viewed on-line - CLICK HERE. More detailed information is available on the NPOR Website itself. The information, originally based on public records, has been supplemented by information sent in by individual contributors. BIOS is most grateful to all those who have contributed material to the NPOR; without them it would not exist. The data is still not complete and additions and corrections are welcome. Updates should be sent to the NPOR Manager at npor@bios.org.uk.To obtain an NPOR survey form CLICK HERE. Data input and editing is controlled by a small group of specialist voluntary editors. 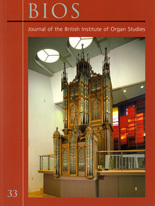 The National Pipe Organ Register has operated free of charge ever since its foundation and it is our intention to maintain this valuable resource for all to use. However, it costs money to manage all the information we receive and to maintain the database. These costs have now increased to a level which BIOS (Registered Charity No.283936) can no longer sustain without help. We therefore want to encourage users of the NPOR to contribute towards its running costs. A donation of as little as 50p for each visit would make a worthwhile difference. As well as seeking single donations, we are also keen to find individuals and organisations to support us on a regular basis. Those able to donate larger sums will be enrolled annually in the following categories: these donors will be gratefully listed on the NPOR website unless they request otherwise.